. :: THUNDER SNOW & BEAUTIFUL ROMANCE HEAD GODOLPHIN G2 CONTENDERS FOR DUBAI WORLD CUP NIGHT ::. Thunder Snow and Beautiful Romance bid for further success at Meydan, UAE, in two of the G2 highlights on Dubai World Cup Night, Saturday, March 25. Both Saeed bin Suroor-trained horses have won at the course this year, with Thunder Snow (Christophe Soumillon) attempting a Classic double in the nine and a half-furlong UAE Derby (17.25hrs local time) after an easy victory on his dirt and seasonal debut in the G3 UAE 2000 Guineas over a mile on February 11. The Helmet colt was one of Europe’s top two-year-olds last year, ending a progressive turf campaign with a five-length success in the G1 Criterium International over seven furlongs at Saint-Cloud, France, in October. Thunder Snow, drawn 13, is joined in the UAE Derby by Top Score (Saeed bin Suroor/Adrie de Vries, drawn five) and Fly At Dawn (Charlie Appleby/William Buick, drawn nine), who both switch back to dirt after finishing first and second on turf in the seven-furlong Meydan Classic on February 23. The field of 16 for the UAE Derby also features Japanese G3 scorer Epicharis, G1 Breeders' Cup Juvenile Turf runner-up Lancaster Bomber and Listed Al Bastakiya winner Cosmo Charlie. 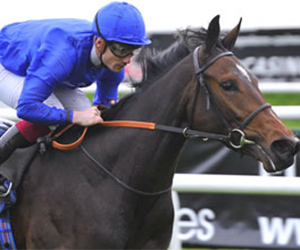 Speaking to Godolphin.com Saeed bin Suroor commented: "Thunder Snow has done well since winning the UAE 2000 Guineas. He worked nicely on Sunday and is ready to go again. "This step-up in distance will be something new for him, but everything is going well and I am hoping for another good result. "Top Score is improving all of the time. He was third on dirt in the UAE Guineas Trial, when he stayed on well, and has been working well, although he also has to prove himself over the longer trip." Charlie Appleby reported: "We are looking forward to stepping Fly At Dawn up in trip. He has been consistent on both turf and dirt at Meydan this year, including when beating Cosmo Charlie in the Guineas Trial, and heads into this race in good order. "It looks a very competitive race, but Fly At Dawn will not be out of place in the line-up." Five-year-old mare Beautiful Romance (Saeed bin Suroor/Oisin Murphy) moves back up in trip for the two-mile Dubai Gold Cup (16.50hrs local time) on turf following an impressive length and a half verdict over Vazirabad in the G3 Nad Al Sheba Trophy over 14 furlongs at Meydan on February 23. She ran well to take seventh on her only previous appearance over two miles in the G1 Emirates Melbourne Cup at Flemington, Australia, in November and scored in the same country 12 days later when getting up on the line to take the 12-furlong G2 Zipping Classic at Sandown. Saeed bin Suroor is also represented in the Dubai Gold Cup by Famous Kid (Silvestre de Sousa), a 14-furlong turf handicap winner at Meydan in 2015. The six-year-old was seventh behind Prize Money on his most recent outing in the G2 Dubai City Of Gold over a mile and a half on Super Saturday, March 4. Saeed bin Suroor added: "Beautiful Romance beat a strong field in the Nad Al Sheba Trophy. She worked well on Sunday and is in good form at the moment. "She ran well over this trip in the Melbourne Cup, but this will be a tougher race than her latest start. "Famous Kid needed the race in the Dubai City Of Gold and will appreciate the step up in distance. He is also in good order." Beautiful Romance, drawn in stall 11, and Famous Kid, from stall two, tackle 12 rivals, including French G1 winners Vazirabad and Quest For More, plus Emirates Melbourne Cup runner-up Heartbreak City.